When you stay at this villa in Protaras, you'll be near the beach, within a 15-minute walk of Profitis Elias Church and Protaras Coastal Promenade. A roundtrip airport shuttle is provided for a surcharge (available 24 hours), and free self parking is available onsite. With a stay at Anastasia Hotel Apartments in Protaras, you'll be near the beach, within a 15-minute drive of Ayia Napa Monastery and Protaras Coastal Promenade. Free self parking is available onsite. When you stay at Villa Knossos in Argaka, you'll be 14 minutes by car from Latchi Beach. Free self parking is available onsite. 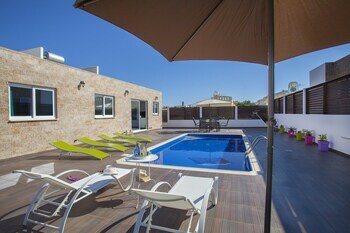 With a stay at Francis Apartments in Larnaca, you'll be within a 10-minute walk of Europe Square and Finikoudes Beach. Free self parking is available onsite.